Skip the pasta and create "noodles" out of spaghetti squash for extra flavour in this Italian-style dish. 1. Preheat the oven to 425ºF. Halve the squash lengthwise and scoop out the seeds. Sprinkle the cut sides with 1/2 teaspoon salt, then brush both sides with olive oil. Put the squash, cut-side up, in a baking dish and cover tightly with aluminum foil. Roast 20 minutes, then uncover and continue roasting until the squash is tender, about 35 more minutes. 2. Meanwhile, make the meatballs: Brush a baking sheet with olive oil. Pulse the celery, carrot, onion, garlic and parsley in a food processor to make a paste. Transfer half of the vegetable paste to a bowl; add the ground beef, ground pork, eggs, breadcrumbs, 1 cup parmesan and 1 teaspoon salt and mix with your hands until just combined. Form into about 24 two-inch meatballs; transfer to the prepared baking sheet. Bake until firm but not cooked through, about 10 minutes. 3. Make the sauce: Heat 3 tablespoons olive oil in a large pot over medium-high heat. Add the remaining vegetable paste and cook, stirring occasionally, until it looks dry, about 5 minutes. Stir in the tomato puree; rinse each can with 1 cup water and add to the pot. Stir in the basil, oregano and 1 1/2 teaspoons salt. Bring to a simmer, then add the meatballs and simmer until the sauce thickens and the meatballs are cooked through, 15 to 20 minutes. Remove the basil. 4. Use a fork to scrape the spaghetti squash flesh into strands; transfer to a large bowl and toss with 2 tablespoons grated Parmesan. Season with salt. 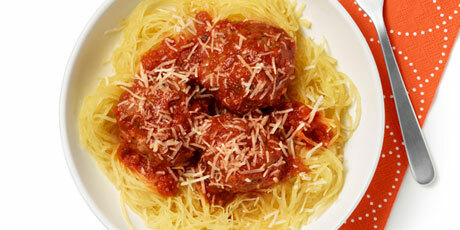 Divide the squash among bowls and top each with some meatballs, sauce and the remaining 1 tablespoon Parmesan. 5. This recipe makes extra sauce and meatballs. Let cool completely, then freeze in a storage container for up to one month.